Beauty shot of the Parroquia. No real relation to anything in the post, just gorgeous. 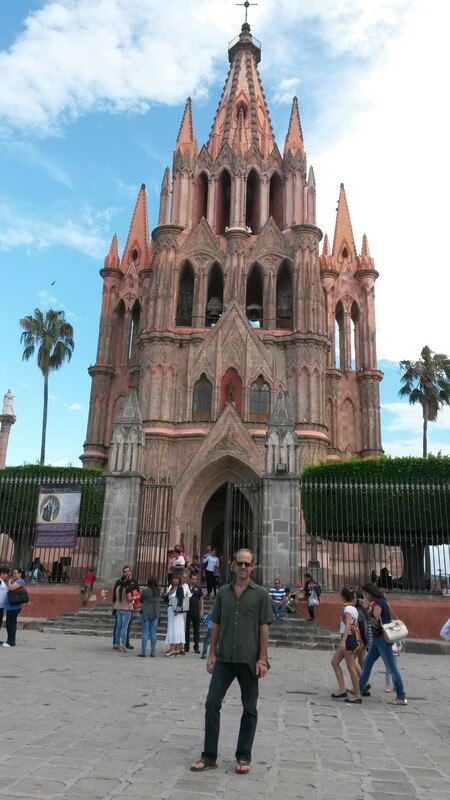 San Miguel de Allende, MX, July 23, 2014: In 1989 we went on a thirty-day honeymoon through Europe, armed only with a hotel to start at, a hotel to end at, $3000 in American Express travelers checks (it was a long time ago, kids, before you could walk up to any ATM in any country and have it spit money at you) and two Eurail passes. In 2000 we went on a year-long trip around the world, having only plane tickets connecting each of eleven countries. Now we’re gone for a year, staying mostly in one place but living full-time and fully-committed in a foreign land. Certainly the world has changed plenty in the last twenty-five years. The bombings of 9/11/01 happened roughly six months after we returned from our big trip, and no doubt they changed travel forever. Yes, we’ve been pulled aside for questioning at Heathrow airport because Wiley had grown a pretty decent and apparently identity-altering beard since his passport picture was taken. Yes, we’ve had Scotland Yard summoned to politely question us in Edinburgh because we arrived without a reservation and paid cash for a hotel room. And yes, we’ve bribed a Peruvian border guard to let us into Bolivia twenty-four hours after our visas had expired. In today’s environment I’m not sure how any of those situations would have played out positively for us. Probably more importantly to the individual traveler, communications have changed dramatically over this time. In 1989 there was no Internet, and no email, and no cell phones that anybody could actually carry anywhere for any period of time. We left home with plans to check in with the American Express offices in Rome and London knowing that they held messages for card holders. You’d think it would be easy to find the American Express office, but Rome is a big place, and I remember spending an entire day trying to find it. Ironically, once we got home all of our loved ones confessed that they had forgotten that part of the plan anyways. We left on our “big trip” armed with the first incarnation of the Sony VAIO, by far the smallest and lightest laptop produced at that point in time. We had Microsoft FrontPage, a full-on old school web site, written in HTML and maintained by me, and a digital camera. There was no Wi-Fi in 2000, so every time the web site got updated, it was via dial-up connection. We accomplished this by stealing long distance phone time. There’s really nothing else to call it, and I probably had a hand in MCI Corporation going down. Don’t remember long-distance kids? Ask your parents about it, and about how phones that were once bolted to the wall. MCI was a large phone company that used to issue long-distance cards to all of its employees, which allowed them to call anywhere in the world for no money, presumably for business reasons but I think they generally allowed them to be used for personal calls as well. I suspect they didn’t really care one way or the other, and apparently, long-distance minutes didn’t cost them much of anything. So when a friend of ours left MCI shortly before we left for our trip, he handed over his card to us, and no one at MCI bothered cancelling the card. We used this card to update our site on approximately a monthly basis from all over the world, checking into a hotel room nice enough to have a phone in the room, and connecting the computer for hours while our stories and pictures crawled over the phone lines to a server in Atlanta, Georgia, from points such as Kathmandu and various islands in Greece. While I’m glad we have a written record of that time in our lives, I’ll not deny that the web site was a source of constant, low-level stress. It became our only link to home, and the only way my mother maintained sanity for a year. I felt like I had to keep our loved ones at home updated on our whereabouts and condition, and if I didn’t, they were worrying, and I was failing. We checked into Internet cafes regularly and answered emails, but the web site was a way to keep hundreds of people apprised of our situation at once. Fast-forward to 2014, where we have a myriad of communications options open to us. This blog, Facebook, Instagram, and Twitter are all open to anyone who knows how to type and has an email address. And these days no self-respecting vacation home owner would leave out Wi-Fi in the list of included amenities, so we’ve been connected to the Internet pretty much since we walked in the door. 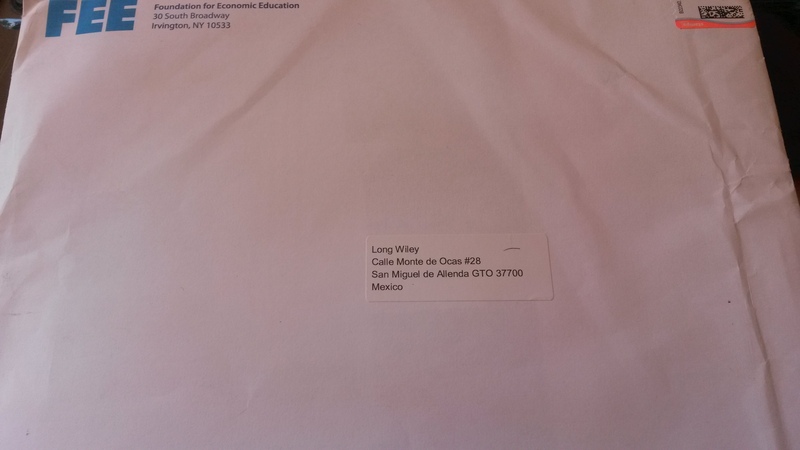 Actual mail, printed on actual paper in an actual envelope that made it first through the U.S. Postal Service and then through the Mexican Postal Service to our door. It’s been the more traditional communications, phone and mail delivery, that have taken some more rigorous efforts on our part. The house gets mail delivery, and as evidenced by the picture someone has found us down here. 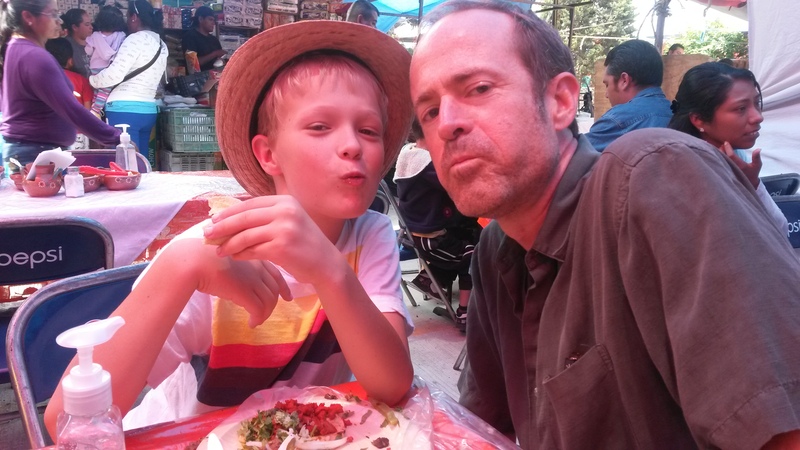 But we’re a little hesitant to place our faith completely in the hands of Mexican Customs authorities, having had a laptop replaced with a phone book once when we were here and attempting to get a replacement shipped to us. As is typically the case in places frequented by tourists, businesses that cater to them spring up. In San Miguel there’s a place call La Conexion, which provides you with an address in Laredo, TX, and transportation of your mail and packages from there to a mailbox here in San Miguel. As far as I know there are no drug kingpins involved, but I didn’t read the fine print in the contract. You pay a flat fee for this service, around $250 per year, and then there’s a small charge per piece of mail and a per pound charge for packages. Best of all, when you order something, say from Amazon.com, you email La Conexion the packing list (which includes the value of the contents) and they wade through the morass of Mexican customs requirements for you. We’ve already had a shipment of Wiley’s contacts turned back because, due to the large amount of contacts in the box (he wears the daily variety), the government believed that we were surely importing contacts for sale. So we’re happy to have professional smugglers mail technicians handling things for us now. Since Wiley is still hard at work running his business reliable phone service was probably the most important item on our list. The house has a local phone, plus a “Magic Jack” voice-over-IP line, which lets us make long distance calls over the Internet for practically nothing. It works, but it’s a little sketchy at times, and we’ve been experimenting with other technology such as Google Hangouts and Skype. Once or twice a week it sounds like there’s a preteen party going on in Wiley IV’s room, while he chats with his buds back in Fort Collins. And we’re finally nearly back on line with cell service. A couple of weeks back we stopped in at a phone store in the mall to talk with them about phone service. She didn’t speak English, so in halting Spanglish we told her that we wanted to use our existing cell phones with Mexican service. She barked “San Francisco, numero cuarenta!”, and went back to her vigorous texting. Luckily I remembered that there’s a street named San Francisco, so somehow we inferred from her I’m-all-done-with-you attitude that she meant for us to leave here and go to San Francisco, number 40. San Francisco number 40 turned out to be an unmarked store front that contained a cell phone office. Once again we gamely tried to communicate with the girl behind the counter, but luckily a man came in who worked there AND spoke English. He explained the slightly scary-sounding process of unlocking the phone, putting in a new sim card, and getting a Mexican number with a Mexican cell company. For Wiley’s phone the unlocking would be done by some dudes in Mexico City and would take a week to ten days. For mine, Miguel kept my phone for four slightly anxious days during which I received several updates letting me know that my phone was very difficult. Ultimately, I got it back a couple of days ago, wiped clean of all my data and apps. Miguel did tell me that was going to happen. The data was backed up, so that was OK, but I did have to spend some time downloading apps again. The end result was the unlocking, the new sim card, a year’s worth of service with 1000 minutes of calls, 100 texts, and 1 GB of data per month, for about $160. Let’s just hope it all works. So far, so good. The boys being totally available…for their lunch. So once Wiley’s phone is converted over we’re completely back on the grid. There’s something to be said for being disconnected, as it seems to happen so rarely in today’s world. When I worked I went into full blown panic mode if I discovered that I did not have my phone with me, imagining all sorts of veterinary-related disasters at my office and my colleagues lodging formal complaints against me due to my lack of availability. There’s a peace that comes with not being quite so… available.